B&W Artisan Pro X is the latest evolution of the B&W Artisan Pro software panels. It is a Photoshop panel for pure and unrestricted B&W editing. The software is designed and developed by a B&W fine-art photographer, educator and highly praised expert on B&W photography, for other B&W fine-art photographers who need powerful but easy to use tools to support and express their artistic vision without any technical restrictions. With this latest version, Joel Tjintjelaar, the designer, states that he has finally succeeded in automating his entire manual workflow, iSGM, into this software. A manual workflow that was developed by Joel in 2010 with the objective to completely control an image and create atmospheric and dimensional depth in photos, and has been adopted by thousands of B&W photographers, the world over. Many of them have become award-winning photographers and respected B&W instructors themselves. This software does what no other B&W editing software can do in an intuitive and easy way: creating dimensional and atmospheric depth using dynamic gradients (new for version X) and Joel’s method of ‘restore’ to shape lighting effects (new for version X) with unmatched subtlety and accuracy. The new Special FX feature adds even more subtle lighting effects to give 3D depth to buildings. Local darkening/lightening or contrast adjustments are done intuitively with quick and rough lasso selections, for fast and accurate adjustments. The technology under the hood consists of automatic variable feathering and automatic and variable counter-gradients (new for version X) to ensure subtle but very accurate blending of adjustments with adjacent areas. It is the ultimate tool for creative B&W expression. The new Creating Depth section contains 200 new presets. This is based on my iterative Selective Gradient Masks (iSGM) technique, a technique that took me years to develop and master. A technique that would normally take many steps and practice is now fully automated. Add depth or presence to your images with just a few clicks of the mouse. Create gradients in skies, buildings, water or anything else you can think of. With the Special FX menu you can add custom streaks of clouds or reflections to anything. The possibilities are endless. Toning an image is always the last step in the B&W process. That has always been like this in the analog darkroom and I would strongly recommend it too for the digital darkroom. I would encourage using one of the split toning presets I’ve created in this panel as they can add a bit more of emotion or symbolism to your B&W image. I would especially encourage this since the split tones generated by this panel are far more sophisticated and subtle than the split tones that you’d usually find in other software. The split tones in this panel are generated through a method I’ve developed that will ‘split’ out the 3 major zones (shadows, mid-tones and highlights) through several luminosity masks with which I can precisely control the amount of color and its ‘visual weight’ in the targeted tonal area in the photo. The differences are subtle but the final print will benefit from it. The image below shows 3 of the 22 toning presets. In addition to the preexisting 22 toning presets, the panel now comes with 2 new random toning presets. The new Split Toning Generator allows you to create a new and unique look every time you press the button. The generator creates a look based on hand-picked values, ensuring a unique and proper result. The split tones are fully customisable, allowing users to create any specific look that he wants. The B&W Conversion section is the starting point for your B&W workflow. Choose a neutral conversion or try out the other conversion presets to get some inspiration. Recommended is to go with a neutral conversion and then adjust with the Advanced and Micro Zone Adjustments. Of course you can use the other presets as a starting point too. In the image below are 3 conversions shown. Can not find the look that you want, using the default 10 B&W conversions presets? Then try out the new B&W generator. With 4 new presets you create unique Black and White images, that are randomly generated using hand-picked values, ensuring quality results every time. Just like the Split Toning Generator, these presets are fully customisable. Pictured above is an example of the presets. The Advanced Adjustments have been redesigned to incorporate dynamic feathering. The panel now recognizes the size of the selection and will output results based on that size. In previous versions users would get unwanted or no results at all when using very large or very small selections. The Advanced Adjustments can now be used on any selection size and will always give the result that you're after. With its 27 presets Advanced Adjustments are ideal to darken or lighten areas in your photo without needing to worry that it will not blend and match with the adjacent areas in your photo - it always has a smooth and ‘smart’ transition due to the method of darkening or lightening applied. In the image below is an example of how Advanced Smart Linear Adjustments works. 1 is the base image. I then made a very rough selection of the Flatiron building and darkened it with the D2 button (2). 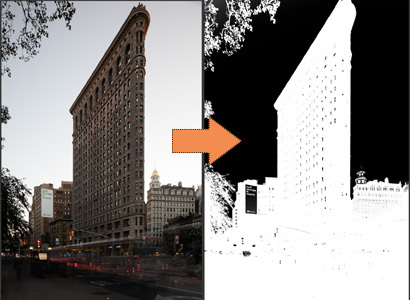 I also darkened the building to the right of the Flatiron using the D3 button (3). Again, A very rough selection was used. Finally, I darkened the foreground (4), using the D3 button. Within seconds I made non destructive adjustments. Just like the Advanced Adjustments, the Micro Zones have been redesigned to integrate dynamic feathering. Micro Zone adjustments are more refined and bleed out less in adjacent (not-targeted) areas than Advanced Adjustments. Unique about this feature is that you can target specific zones. In the example below I wanted to lighten the area in the sky behind the glass pyramid at the louvre without affecting the rest. After sampling the area (click the "i" icon in the panel) I noted that the part I wanted to lighten has an average luminance value of around 160, which corresponds with zone 6-7. Now that I know what zones to work with, I select the corresponding zone from the dropwdown menu and click Activate. Then I make a rough selection of the area I want to lighten using the Lasso Tool and click on of the lighten buttons to lighten that area. We have replaced the old 11 'Zones' with 'Micro Zones'. The Micro Zones now generate a total of 31 Micro Zones. All zones and luminosity masks are 16 bits. 12 Global Adjustments presets that are meant only to adjust light/shadow/contrasts on a global level. For example increasing the highlights in a image or decreasing the contrast for a low key effect. - Creditcard: you will find the field in which to enter the discount code on the next pages on this store. - Paypal: you will be redirected from my store to the Paypal page and it will ask you to login first. After login you will be asked to review the purchase and then you can enter the discount code. - This panel is for use in PS CC 2015.5 and higher. - Please check Adobe's website to see if your computer can run Photoshop. - The panel is language independent. - The original color version of The Salk Institute to practice alongside the Demo Video. - Free technical updates (functional upgrades may be charged depending on the new features). Quick Mask Pro v1.2 has been updated with 16 bits luminosity masks, and use of the same 16 bits masks in all presets that use masks, such as Advanced Reﬁne mask where the activation of a tonal range will also result in the creation of speciﬁc luminosity mask in 16 bits. Furthermore Quick Mask Pro now comes with the Load and Optimize Mask feature that will ensure that a mask that has been ﬁnished will get a soft edge. This is a feature that should be used at the very end and saved separately. Quick Mask Pro v1.2 is now using 16 bits luminosity masks instead of 8 bits masks. Even though the difference between 8 bits and 16 bits luminosity masks is only visible when applied with extreme settings in extreme situations and the advantages of using 16 bits luminosity masks compared to 8 bits masks is largely mitigated when loading channel masks as a selection (a selection is always 8 bits inside Photoshop), we believe it’s always better to give the discerning user more bit depth. Tests have shown that there’s only a visible difference in the end result in a minority of the cases. Create intricate base masks within seconds with a few mouse clicks. Refine your base masks fast, easy and non-destructively using the buttons under Quick Refine Mask. This replaces the traditional, labour intensive, workflow of manually refining your mask using a brush or pen with a tablet. To bring out the most delicate parts of your image, like fences, railings, cables, antenna's or even hair, use Advanced Refine Mask. Every selection tool is based on detecting contrasts or differences in luminance values. Quick Mask Pro can create selections based on luminance levels of just 1 luminance value difference. The secret of this tool is in the automatic creation of base masks based on the histogram and the tools to refine the base masks using smart fill presets that are activated by the click of a button, globally or within a designated area of the image, very accurately. The panel creates three base masks after clicking one of the five presets found under Base Mask, that roughly corresponds with your histogram. Then evaluate the base masks in the Channels panel. If you're not sure what preset to choose, you can simply try out the other presets. In total there are 15 possible base masks. In the image below I created a base mask using the preset Low Mid, with just one click of the button. As you can see, it's already pretty accurate. The quality of the generated Base Masks depend on the quality of the photo in terms of good object/background isolation and contrast/exposure. Sometimes this results in very accurate base masks that only need some additional fine tuning and other times the fine tuning can be more extensive. Here is where Quick Refine Masks comes into play. Use smart selective fill presets that will only darken or lighten selectively. This, again, replaces the traditional brush and tablet workflow. The image below is a close up of the image above. It is the dome on the bottom right of the Flatiron Building. Using Quick Refine Mask I managed to refine the mask non-destructively with just a few mouse clicks. To bring out the most delicate parts of an image, use Advanced Refine Mask. In the image below, I zoomed in on the dome above. By the way, this is on 400% magnification! Right next to the dome is a small fence. Invisble with the naked eye in real life, hardly visible when zoomed in 400% in Photoshop. Still, using Advanced Refine Mask I managed to bring out some of the detail. Left: after using just Quick Refine Mask. Right: after applying Advanced Refine Mask. Quick access buttons to most commonly used tools: Load Selection, Deselect Selection, Delete All Channels, Delete Channel, Delete Layer, Duplicate Layer. Create a Base Mask depending on the histogram of your image. There are a total of five options: Low Key Studio, Low Key, Low Mid, Mid High and High Key. Each Base Mask preset generates three masks, found under the Channels Panel. Refine your mask quickly using the presets under Quick Refine Mask. Simply click a button to refine, instead of spending hours using a brush and tablet. Use Advanced Refine Mask to bring out the most delicate parts of your image. It can reveal and mask details that are hardly visible when looking the photo zoomed in at a few hundred percent. Under the Luminosity Masks tab you will find presets to create and delete Luminosity Masks. Also included are Half Luminosity Masks. The most commonly used tools for making masks are found under this tab. This panel is built for Photoshop CC2014 and higher, including Photoshop CC 2018. The panel won't work on Photoshop CS versions. 2. Installation instructions manual and video. 3. An accompanying video tutorial of 25 minutes, exclusively made for this panel.